We’d love your help. 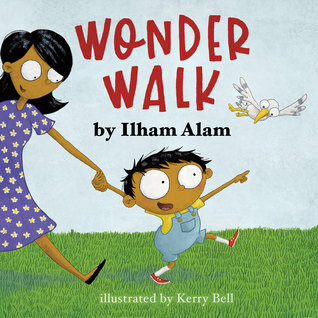 Let us know what’s wrong with this preview of Wonder Walk by Ilham Alam. To ask other readers questions about Wonder Walk, please sign up. This was one of the most cute pictures books read in recent times. Written by Ilham Alam and illustrated by Kerry Bell, the book captured my attention from the first page. There is something so innocent and pure to see a mother and child going for a walk and discovering the wonders of nature. Ilham Alam's story had me smiling as I turned the pages. Little Johnny's curiosity and awe at seeing a sunflower, a bug, mama bird with baby bird touched my heart. What we forget to see when we go for our wa This was one of the most cute pictures books read in recent times. Written by Ilham Alam and illustrated by Kerry Bell, the book captured my attention from the first page. There is something so innocent and pure to see a mother and child going for a walk and discovering the wonders of nature. Ilham Alam's story had me smiling as I turned the pages. Little Johnny's curiosity and awe at seeing a sunflower, a bug, mama bird with baby bird touched my heart. What we forget to see when we go for our walks, the children see them clearly. Little Johnny lets his curiosity take control as he discovers all sorts of fun things in nature. With bright and colorful, this book joins a very energetic child, who gives his mom quite the run. It's short—great for those with very tight attention spans. However, the wording isn't as compact. Written in rhyme, the adventure becomes quite a bundle of words, and it fits Johnny's personality nicely. Even the mom gets a little bamboozled, which induces a lovely sense of humor along the walk home. An Little Johnny lets his curiosity take control as he discovers all sorts of fun things in nature. With bright and colorful, this book joins a very energetic child, who gives his mom quite the run. It's short—great for those with very tight attention spans. However, the wording isn't as compact. Written in rhyme, the adventure becomes quite a bundle of words, and it fits Johnny's personality nicely. Even the mom gets a little bamboozled, which induces a lovely sense of humor along the walk home. And Johnny wears himself, making this a great bedtime read as listeners can snuggle in along with Johnny for dreams. The curiosity and amazement of Johnny is fun to follow, and considering it sticks with his small finds in nature, a lovely mix. There isn't a whole lot going on—Johnny only discovers a few things but even these bubble from him—but it just enough for a very, quick read. Especially very young listeners (ages 2 to 4) are sure to enjoy this one. Johnny and his mommy go out for a walk. Johnny is excited over all the beautiful, scary, and new things he sees. Why is the bug out so late? What is that yellow flower? Why is that bird unfriendly? The book is a very short read which perfect for the little ones with very short attention spans. It was a fun read especially with rhymes and the colorful artwork. Overall, a perfect read for bedtime! This was an extremely short read but perfect for those 2 to 3 year old attention spans! It's a colorful and rhyming book that was easy to read and I could see young kids wanting to read it over and over again for the beautifully done illustrations in this book. If anything, this looks to be the perfect bedtime story for young kids that shows Johnny and his mom with a ending that most parents are looking forward to every night! Thank You to Ilham Alam for this extremely short but cute read!! I volu This was an extremely short read but perfect for those 2 to 3 year old attention spans! It's a colorful and rhyming book that was easy to read and I could see young kids wanting to read it over and over again for the beautifully done illustrations in this book. If anything, this looks to be the perfect bedtime story for young kids that shows Johnny and his mom with a ending that most parents are looking forward to every night! I liked the illustrations and the rhymes. The illustrations were my favorite part. It has objects, creatures not mentioned in the story-line, these can be used to interact and add to the story, what do you see? How many do you see? The curious child and loving mother who at one point is not sure how to answer was clever. I think three or four-year-old would enjoy this book. Would definitely recommend this book! Wonder Walk is an engaging, adorable book with vibrant illustrations. It also serves an important reminder to stay curious and appreciate the wondrous world around us.